Cabre at New Hampshire earlier this year. 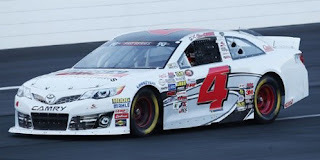 Chase Cabre scored the first last-place finish of his NASCAR K&N Pro Series East career Friday night in the Casey's General Store 150 at the Iowa Speedway when his #4 Honda Generators / Rev Racing Toyota fell out with transmission issues after 35 of 150 laps in the race. Cabre is the younger of two Cabre racing brothers; his brother Collin ran with Rev Racing for three years in the K&N Pro Series East, scoring a lone win in his rookie season of 2015. Chase’s racing career started in the motocross ranks at the age of three and moved through karting and circle track racing. He moved up alongside brother Collin together in the K&N Pro Series East ranks last year, outlasting his elder sibling by about forty points and three positions, sixth to ninth. He finished second at Memphis, a highlight of a season that saw him win poles for the South Boston Twin 100s but falter towards the end of the season. He returned to the 4 car in 2018 but again switched numbers for Thompson throwback weekend (6 in 2017, 15 in 2018). Coming into Iowa, he sat seventh in points, once again recording a season-best finish at Memphis with a fourth-place effort. The Iowa combination race came with an entry list of a paltry 25 cars, not enough to sustain minimum field size this season (13 in both East and West) for both series. Of course, car counts fall every year during the season, but 25 was alarmingly low. This is counting one-off Kyle Benjamin, driving for Hattori Racing Enterprises while in town for the XFINITY Series race, and Sam Mayer, his ever-expanding slate finding himself driving a part-time #27 for Jefferson Pitts Racing. For LASTCAR scoring purposes, separate standings are used according to which series drivers run more, East or West. The West contingent of the field did not have a banner weekend by any stretch of the imagination. Jesse Iwuji, whose team bought a new car a week ago exclusively for the Iowa race, trailed first practice. Fellow West competitor Takuma Koga anchored second practice and stayed there for qualifying, his lap of 25.178 seconds a pickup from final practice yet still more than four-tenths behind Iwuji for 24th. Chase Cabre, for comparison, was the lowest-qualifying East car in 21st with a lap of 24.453. The overall last-place battle switched hands quickly, it was Koga at first, then Colin Garrett after an early spin and then Iwuji, who retired after ten laps with motor trouble. Cabre followed Iwuji into the garage after another 25 laps, the team citing clutch issues as the demise. The East Bottom Five was rounded out by Garrett, who struggled with mechanical gremlins, Anthony Alfredo, who after delivering more than his fair share of trash talk wrecked a primary car in practice and drew the ire of Hailie Deegan by wrecking the lead-lap #19 machine as a car two laps down, Ronnie Bassett Jr., both four laps off the pace, and Tristan van Wieringen, his Rette Jones Racing team struggling to master the mile-long oval.